The only magazine for any true Star Wars and Lego fan. Stay up to date with your favourite Jedi, follow the action from the big screen to right in your hands. Inside each magazine, there’s a massive 12-page comic which explores the massive Star Wars universe. Follow the adventures of Luke, Obi-Wan, Han and Chewie as they battle the dark side of the force. Buy a single copy or subscription to Lego Star Wars magazine. Every issue comes with free Lego toys, so you’ll get to build your very own starship or speeder. You also get two giant posters within the magazine. 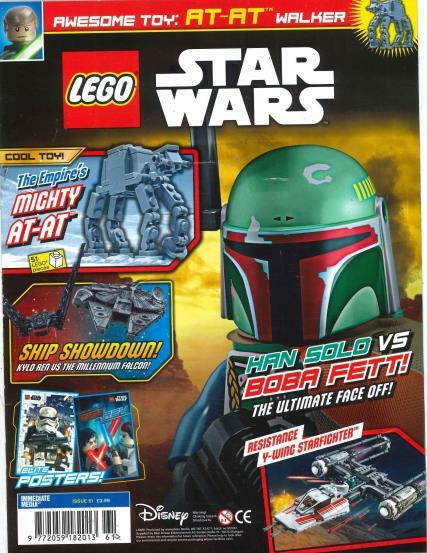 Lego Star Wars magazine is crammed full of competitions and puzzles keeping the reader entertained until the next issue. As Lego Star Wars magazine features two of the most popular children's brands of all time, it's definingly not one to be missed. Stay up to date with when the latest Star Wars Lego sets available and even be within a chance of winning a massive mega Lego set. My kids love the Lego Magazines!!! Interesting magazine with comics and activities to keep young Star Wars fans engaged. Excellent for Kids and the bonus builds are great additions. Super value. My 8 year old grandson is enjoying receiving the magazine and reading it ! I bought this for my 5year old grandson. He was ecstatic when he received it and liked the diversity of it. An excellent magazine for a Lego Star Wars fanatic and even though its quite expensive he has had a lot of play value from it and is eagerly awaiting next month's edition. One happy granny! Excellent magazine not only for children but also for AFOL. Highly recommended. Love the mag. The small exclusive builds are great. I do them with my 3 1/2 year old grandson. We also read the comics together. A great magazine. My son love it and the mini Lego set, of course! Great magazine. My son loves it. He particularly enjoys the mini build. Good stories and puzzles for my 6 year old. The attached free gifts are proper lego toys.